Thank you soooo much for the weekly meal plans. I use it every week and now only do my shopping once a week, where I used to go to the store 3 times a week. Love the meal plans! Appreciate you sharing them for free – such good recipes and a good way to stay focused during the week! Just found these meal plans last week. Absolutely love the plans and the ability to switch up the recipes. I’m a picky eater, so being able to find meal plans that work for me is tough. Most recipes are super simple. Thank you! I absolutely HATE cooking. Also, the benefit of the meal plan for me is that if it’s written, I’ll stick to it. If I’m left to my own devices….well we all know how that goes! Wonderful, that is my hope! That you can customize it to your liking! Thank you for the meal plans. They are very appreciated. Thank you so much for all you do to help us live healthier lives! I’ve been “observing” & coping recipes for awhile, but it’s time to get more serious and back to the basics! Appreciate all the work you do to keep us on the Journey! These meal plans are great. Please keep sharing!! 🙂 looking forward to the one you post today! Yes, yes, yes! Please continue your meal plans. I depend on them. Thank you so much for sharing your meal plans. They keep me from getting in a cooking rut. I enjoy your cookbooks as well. I’ve just discovered your blog and am excited to try your recipes and meal plans. I did have a question, though. In your meal plan description, you’ve stated that the dinner recipes are for 4 servings. I’ll be cooking for two, so that’s easy enough to adjust. However in the recipes themselves, the listed serving sizes at the bottom in the nutritional information vary (ex: Baked Penne is 8 servings, Empanadas are 10 servings, etc.) Which should be followed? Thanks! yes but look at the serving size, it matches the meal plan. This my second week using your meal plan and I already feel my clothing is looser. I am a home cook and love that these are real recipes, not just the typical Semi-Homemade fare. I also love that there’s a healthy mix of time consuming to easy dinners, important for working moms. In addition, it’s great that you try to incorporate stuff we bought last week in this week’s meals (I’m looking at you ricotta cheese). My son is adventurous and has been eating everything along side me (he’s 7). Thanks!!! Awsesome!! Glad you are enjoying them! This week was my first time using one of your meal plans despite how frequently I use your recipes. I absolutely love it! It has made it easy for me to know what i’m having for the weekend and actually saved money since I already have so many ingredients. I feel like i’m eating healthy but still getting my treats in! It has also allowed me to branch out and try new things (i never would have tried empanadas or the beans). Everything has been a hit so far! Thank you for this! I’m making pretty much the whole plan this week – just swapping out the salmon on Friday for your shrimp and tortellini salad. Looking forward to next week’s plan already! Yes!!! I was so bored in the kitchen with the recipes I was using, you have inspired me to start cooking again with what you were sharing. Please keep them coming! I love your meal plans! Please keep them coming! Thank you so much!! I don’t see the link she usually put for the Google Doc. Did anyone find it? Looking for the link to the Google Doc. Thank you so much for MY week’s plan. I’m always waiting for it because I love all those suggestions! I never made flank steak (beleive it or not!!!) and I’m in hurry to try this one. Your meals plan really do a difference in my life. A real help. Wow! I just found your weekly meal plans…what a blessing…I’m a teacher at a private school and don’t make very much money…so to find someone like you that has taken the time and effort to do this for those of us that could use the help AND offer it for free! Thank you for all that you do…I have tried many of your recipes and love them…and admire you for the work you do for others. Blessings on you and your efforts. Love this week’s plan! I will make it next week when we return from my son’s destination wedding and I need a reboot. Every recipe for this week is doable for a tired mother of the groom! Where’s the link to the google doc? It should be working, let me know if you are still having trouble. I was going to leave the same comment. 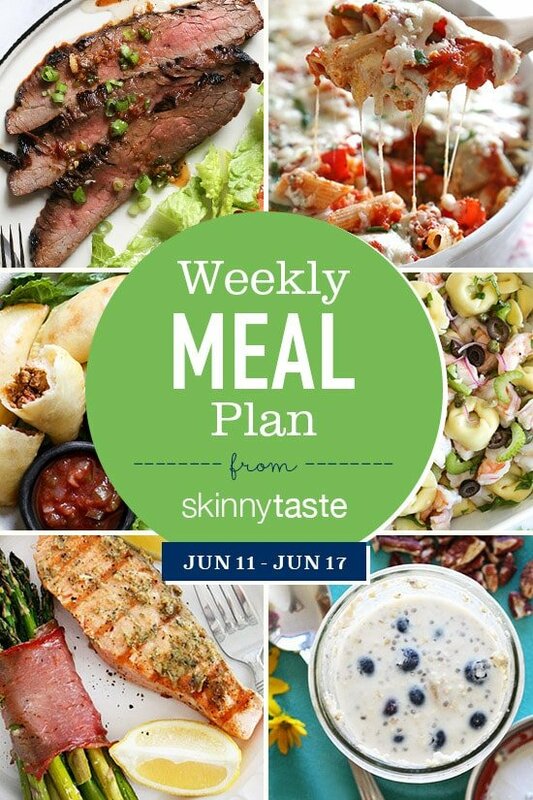 I love these meal plans and use them every week! I can’t wait to try this week’s plan- thank you so much for creating it and making it so easy to use! 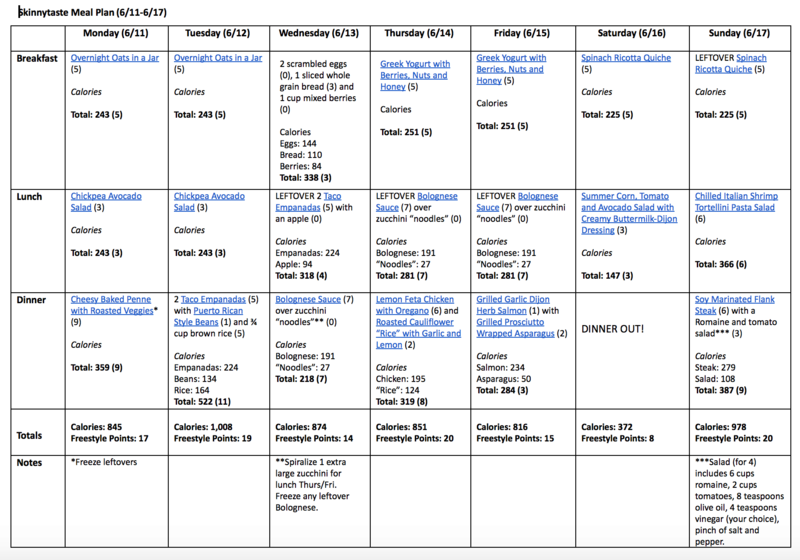 Thank you sooo much for posting these meal plans. They’ve made my life so much easier! I use them and love them! I like your recipes and your plan verry much. These is no google doc link for this one. Please continue to provide the meal plans. I love the combinations and the flexibility the plans allow. Not many that give you options and so much variety. Thanks! Thank you so much for these menu plans. I’ve lost 80lbs with weight watchers and recently scale was stuck for 5 months about 20 lbs from goal. The scale has started moving again following your meal suggestions. It has focused me back to what I’m sure Freestyle is all about. I’m < 10lbs from goal now. I anxiously await each weeks plan! Please keep sharing meal plans! I’m a very limited Facebook user and love to check your website for meal plan ideas to help me plan the week!